The Irish American baseball legend who introduced the concept of the opening day pitch by the President of the United States. James Robert, “Jimmy,” McAleer, the youngest of eight children, was born in Ohio on July 10, 1864. He gained fame and notoriety for being a player, manager, and stockholder in Major League Baseball who assisted in establishing the American League. Apart from his career highlight of leading the Boston Red Sox to the 1912 World Series, McAleer is most often remembered for initiating the customary request that the president of the United States throw out the first ball of the season. Though Jimmy McAleer was born in Youngstown, close to the border of western Pennsylvania. He came from a strong Irish background. It is believed that his father, Owen McAleer, and English mother, Mary (née Miller), immigrated to Canada from Ireland in the early 1850s, before moving to Youngstown not long before Jimmy’s birth. His father was a boilermaker and all of Jimmy’s siblings found employment as factory laborers as soon as they were old enough to work. Jimmy’s older brother, Owen, Jr., later moved to California, founded an iron and steel company there, became a wealthy industrialist, and, from 1904 to 1906, served as mayor of Los Angeles. Jimmy McAleer pictured on a 1909 Ramly tobacco baseball card. Jimmy McAleer’s first foray into baseball was in 1882, when he became involved with a minor league club in Youngstown, playing for two years as a center fielder. His talent shone through, and he played for teams in South Carolina and Tennessee before finally breaking into the major leagues with the now-defunct Cleveland Spiders in 1889, where he adopted the nickname “Loafer” for his casual but effective style. He had an eventful playing career with the Spiders and became noted as an outstanding outfielder who was “blessed with excellent speed,” according to contemporary newspaper accounts. While his only major triumph as a player arrived in the post-season Temple Cup tournament, his team finished runners-up in the National League on several occasions. 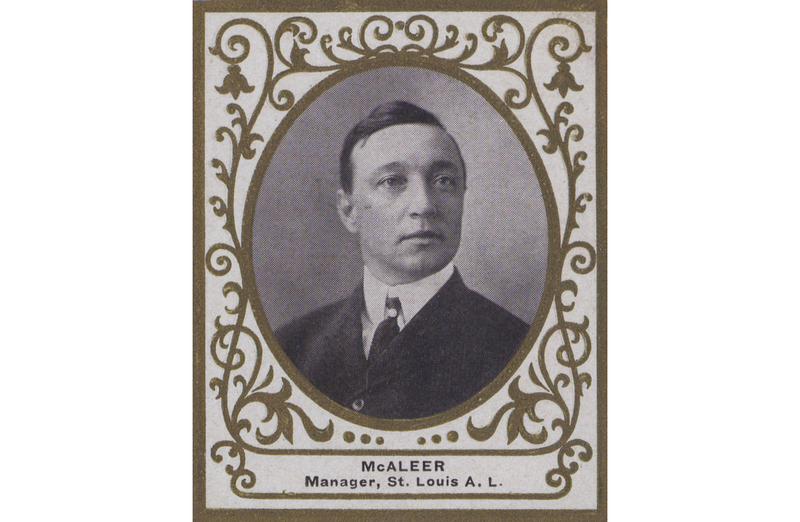 McAleer’s subsequent career as a major league manager (1901 to 1911) overlapped with his playing career. He played his last major league game in July 1907, having initially taken over the reins of the fledgling Cleveland Blues team at the beginning of that decade and switched to the St. Louis Browns in 1903. Aside from baseball, McAleer also had connections in entertainment. Early in his career he became part owner of the DeHaven Comedy Company, a theatrical road troupe that was organized in Youngs-town. In later years, it was acknowledged he enjoyed strong friendships with well-known musicians and performers like George M. Cohan. A brief spell in charge of the Washington Senators led McAleer to initiate what became a famous baseball tradition. On April 14, 1910, he asked the visiting president William Taft to throw out the first ball of a season opener. President Taft, an ardent baseball fan, readily agreed, and an integral American tradition was created thanks to McAleer’s quick thinking. Jimmy McAleer resigned as manager of the Senators towards the end of the 1911 season, and the following season became a major stockholder in the Boston Red Sox, a team with a huge Irish American support. McAleer enjoyed a major success with the Red Sox, who defeated New York Giants in 1912 at the legendary Fenway Park to clinch the World Series by four games to three. That was the zenith of McAleer’s success in Massachusetts, however. Following a major dispute between himself and Red Sox manager Jake Stahl, two factions formed within the club. Shortly after McAleer fired Stahl and appointed Irish American Bill Carrigan, other Red Sox executives grouped together to dismiss McAleer. With McAleer forced to sell his shares in the club to the other executives, he found himself out of the baseball scene. He never returned to the game again following the pain and distress of the Red Sox episode during his final year at Fenway Park. According to David Fleitz, whose 2009 book The Irish in Baseball: An Early History chronicles notable players and managers of Irish descent, Jimmy lived in his native Youngstown until he became ill with cancer in the early 1930s. On April 28th, 1931, just four months after his second wife passed away, it is believed Jimmy tragically shot himself and died the following day at 66. Well, a lot of people want to throw out President Trump, but I’m not one of them.